Our car may be one of the most expensive assets we own, but the carports that we build to house them need to be far more than just a way to keep the elements out. These days, carports also need to add style and class to your home. Just like this Brisbane carport. Walk past the house and you’d probably think the single Brisbane carport was built at the same time as the house, but in fact it was built many years later by Mr Carports. The brief was to build a single carport for the Queensland home that perfectly matched the existing house. While this may seem simple to achieve, in practice it was less so. This was due to the significant slope of the driveway, which without careful thought could have resulted in a carport that looked very top-heavy. To overcome this, timber slats were fitted down the sides and front of the carport, to better balance the design. The slats closely resemble the slats of the picket fence, which help to match the carport to the house. The timber end-fill at the front of the carport was chosen to match the weatherboards on the house. The posts and roofing materials were chosen to match the style and colour of the house. All paint colours were carefully selected to match the home. 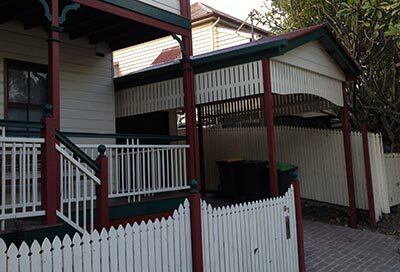 The end result is a beautiful Brisbane carport that protects the homeowner’s car and adds to the style of the house. Looking to build a Brisbane carport for your home? Want to add style as well as provide protection for one of your biggest assets? Mr Carports can help you throughout the entire process – from the design and all the key decisions, through to clean up at the end. Give us a call on 1800 557 782 or look at our Brisbane branch page for further inspiration.